There will be a fan bus going to wrestling tomorrow, February 26th. Plenty of room for adults or students to sign up. Contact Nancy @ 732-7395. Cost is $12. Leaving 8:30 AM from front of high school. You will need to buy admission ticket at Xcel Center. The K-3 team traveled to Waseca today and brought home 3rd place. We were able to defeat Adrian, Faribault, and Pine Island while losing to GMLOKS. The hard work these guys are putting in shown through today. Great job boys! A special treat for tomorrow night’s youth practice- the varsity will be in the wrestling room to be introduced and hopefully can stay to show some moves and help lead practice. 4th through 6th graders are welcome to come to the early practice to take advantage of this opportunity as well. Come with questions and learn how these guys became the best of Section 1A! The full schedule for State team and individual is here. The team will wrestle their first dual at 11:00 AM on Thursday at the X. Go cheer them on in person, there is no other experience quite like it. State wrestling and Mat Rat t-shirts are for sale. Monday- Practice. PreK-3rd at 5:45. 4th-6th at 6:45 but arrive early to meet varsity wrestlers. Thursday- Watch Cougar team at the X.
Friday/Saturday- Watch Cougar individuals at the X. Six Cougars advanced to the Individual State Tournament which will be held next Friday & Saturday, Feb. 27-28 at the Xcel Energy Center. Great job guys! There will be a send-off/pepfest for the wrestling team at 1:00 Wednesday afternoon @ the ZMHS gymnasium. Come show your support & wish them the best at State!!! 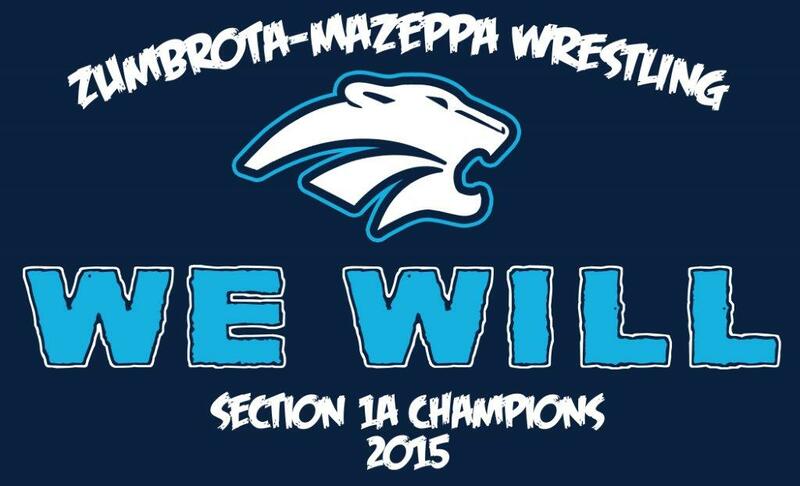 ZM State Wrestling shirts are in production…they will be on sale Monday, February 23rd through Bev Prodzinski @ the high school. We will also have them available on Monday night during elementary practice & the booster club meeting. A LIMITED number of shirts will be for sale @ the section tournament tomorrow & Saturday. Shirts are $15. They did it!!! The Cougars earned a trip to the state tournament! 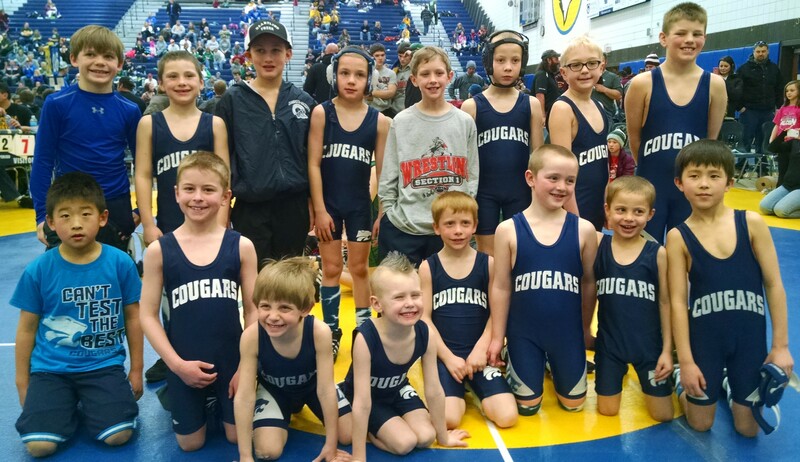 The Cougs met Dover-Eyota in the semi-finals, winning 48-18 to send them to the finals vs rival Kenyon-Wanamingo. In a very intense match-up, the Cougars pulled off the victory 27-26. Thank you, Cougar Fans, for coming out to cheer them on! What a showing of teamwork & school spirit…it was an amazing & memorable day!!! Eight Cougars have been selected to the HVL All-Conference Team: Spencer DeFrang (106), Hayden Stensland (113), Joey Majerus (120), Freedom Hunt (145), Caden Steffen (152), Devin Manzy (160), Dillon Downes (170), and Noah Prodzinski (182). Maverick Jackson (132), Jacob Bennett (138), Seth Tupper (195), and Evan Block (220) all earned Honorable Mention. Congratulations, guys, way to represent ZM!!! 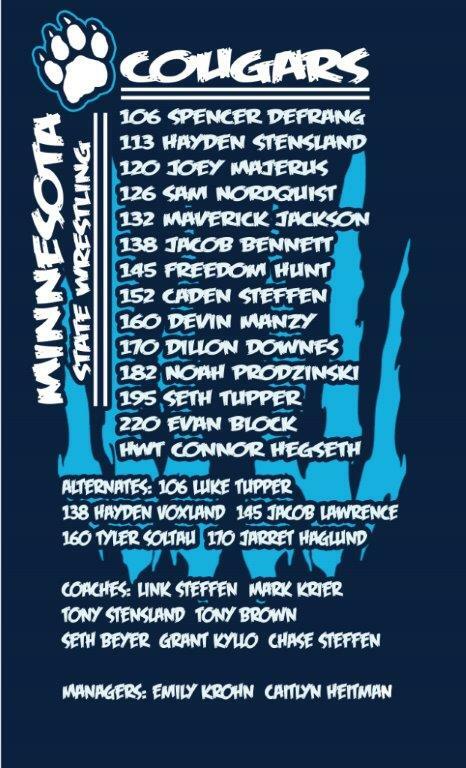 Also, the ZM Wrestlers have once again been selected to the Silver All-State Academic Team…AWESOME! Come show your support for these amazing student-athletes TOMORROW @ the Mayo Civic Center. The Cougars will wrestle Dover-Eyota in the semi-final match at 2:30 pm. Section Finals are at 4:15.